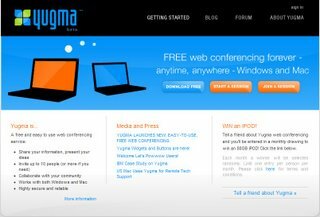 Yugma is a free web conferencing service that enables people to instantly connect over the internet and to collaborate using any application or software, using both Windows and Mac. Businesses can connect on-demand and real-time with clients, prospects or employees whether they are across the city, nation or even the globe. You need download a software that lets you connect Yugma.